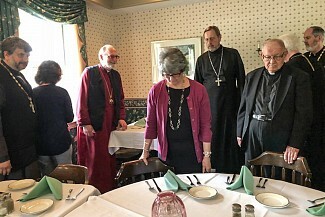 On Thursday, May 17, His Eminence, Archbishop MARK, along with clergy from the Wilkes-Barre Deanery gathered to honor Father Daniel and Matushka Myra Kovalak upon their retirement. the group gathered at Bear Creek Inn to celebrate Fr. Dan’s many accomplishments and wish him well as he moves on to a new chapter in his life. May God Grant Father Daniel and Matushka Myra Kovalak Many Blessed Years!